In the music world, 2016 has been a rough year — and continues to get tougher. Just over a week after the loss of Leonard Cohen, news broke on Friday that Sharon Jones has died at age 60. According to a statement on the soul singer's website, she lost a "heroic battle" to pancreatic cancer, which she had been fighting since 2013. She left her mark by working with Sharon Jones and the Dap-Kings, where she served as the lead singer. In the wake of this news, fellow celebrities are taking to Twitter to mourn the loss of Jones. 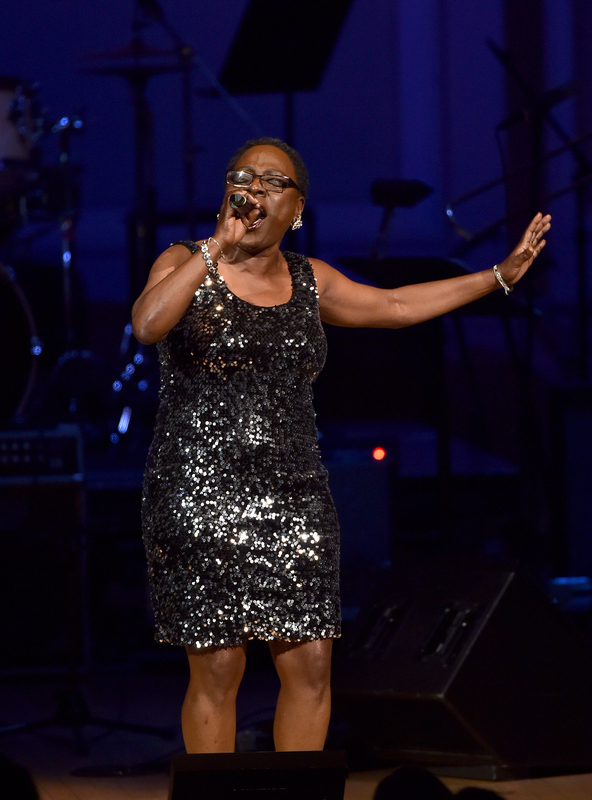 The statement on Jones' website reads, "We are deeply saddened to announce that Sharon Jones has passed away after a heroic battle against pancreatic cancer. She was surrounded by her loved ones, including the Dap-Kings." Instead of flowers, her loved ones are encouraging people to donate to various organizations in her honor, including The Lustgarten Foundation, James Brown Family Foundation, and Little Kids Rock — supporting pancreatic cancer research, individuals in need, and children's music education, respectively. Although it's never easy to say goodbye, here's how famous people are coming together to honor Jones' legacy. Their words are a reminder of just how much she touched the music business. Goldberg acknowledges just how strong of a singer Jones truly was. The Paramore singer's tweet is a sad reminder of the major losses in 2016: David Bowie, Prince, Leonard Cohen, and now Jones. In 2014, Legend and Jones performed a powerful rendition of Marvin Gaye's "What's Going On?" "Gut-wrenching" also works as an adjective to describe this news. As the former Nickelodeon star points out, the documentary Miss Sharon Jones! is well worth a watch. His words are a testament to Jones' talent. Just like Legend, Bublé reflected on what an honor it had been to perform with Jones. Monáe calls Jones a legend, a sentiment many have echoed. Khan extended her condolences to the singer's family. A simple, but powerful sentiment — thanking Jones for what she did for the music industry and beyond.